Binary options trading is often compared with gambling (casinos, sports betting and poker games) as commoners tend to believe that the outcome of options trading is highly dependent on theory of probability rather than skill. However, unlike gambling, success in trading can be achieved through proper strategy and discipline. Successful traders are well aware of this major difference. Likewise, there are several other industries such as spot Forex, equities, software and online marketing industry, that share a fine but striking relation with binary options trading. Instead of crying foul and showing dissent, professionals insist traders to shrug off pessimism and use the similarities from other industries to understand, learn and make a head start in trading. The hard lessons which can be learned from gambling, software, Forex, equities and online marketing industry will save a pile of money, if applied properly by a binary options trader thereby leaving a lasting positive impact on the performance. Those who have played roulette would not face difficulty in understanding the binary option trading system. Similar to red or black bets in roulette a binary option trader will be placing a high or low order. Other finer details such as asset selection and entry price can be learned quickly by those who have played in casinos (online or offline). Coming back to financial markets, a binary options trader can learn a lot from spot Forex and vanilla options traders as far as placing orders is concerned. It is a well known fact that apart from buy and sell orders, Forex, options and stock market do involve a wide range of orders such as stop-loss, market order, limit order, and good-till-cancelled (GTC) order. A binary options trader should put efforts to learn the difference between these orders so that it will be easy for him to quickly learn the process of placing orders in trading. Experienced gamblers, over a period of time, will develop strategies to consistently beat the house. Similarly, good binary option traders can precisely device trading methods to achieve high success rate. This is an attribute which can be learned from gambling industry. In particular, a binary options trader can learn a lot from sports betting industry. Those who are involved in sports betting are generally experts in analysis of teams. By understanding the strength and weakness of the teams and the prevailing circumstances, a bet is made on a particular team. Similarly, Forex traders are generally adept in updating themselves with global and economic news. Professional traders know that timely knowledge will allow them to enter and exit before the crowd. Likewise, a binary options trader should have clear idea of the economic and geopolitical news which will impact the value of a currency. Strategy development and in-depth analysis is a worthy aspect to be learned from sports betting and Forex industry. Not every strategy succeeds at the first instance. A strategy may need further improvements. A binary options trader, instead of jumping from one strategy to another, should try to refine the strategy so that success rate increases. It is an aspect which can be learned from software industry. Usually beta versions of software is released in the market and based on the feedback further improvements is done. Even fully tested software may have a bug, which may create trouble in the long-run. The future versions will be devoid of the bug. In the same manner, a binary options trader should understand the minor errors in the strategy and refine them to reach the objective of consistent success in trading. Changing strategies often will not yield the desired result. Professional gamblers are known to have great discipline. Likewise, a binary options trader is expected to be disciplined to taste success. By remaining disciplined, a binary options trader will stick to the well-tested strategy without any deviation. This will ultimately lead to a tremendous improvement in performance. Discipline is one of the virtues, which a binary options trader can learn from gambling industry. Successful spot Forex, option and stock market traders are known to have great discipline. A disciplined Forex, option or stock market trader will be able to perform better with an average strategy than an undisciplined trader with a highly successful strategy. 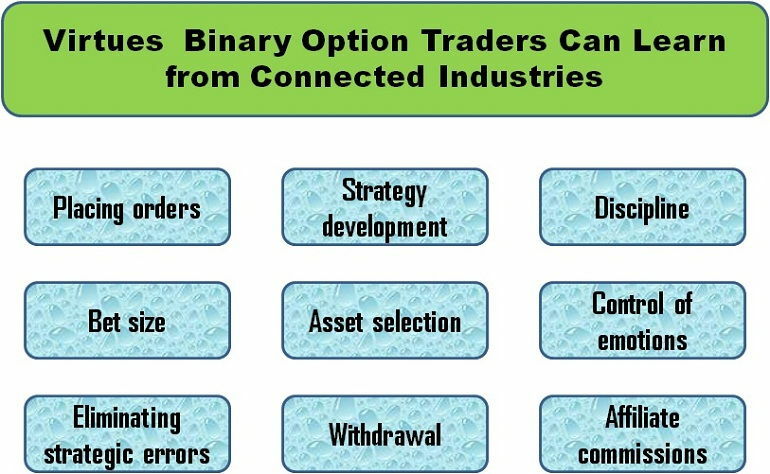 A binary options trader should try to imbibe such a virtue from these connected industries. A gambler will always have a control over the bet size, irrespective of the recent success encountered by him. Such a strategy will save his account from going bust when there is a series of losses. In the same manner, a binary options trader should never feel over confident and use not more than 5% of the total investment in every trade. This would prevent erosion of capital when a handful of trades go against the prediction. Learning to keep a control on the volume or bet size is a lesson to be taken from gambling industry. Again, it is worthy to mention about Forex, option and stock market traders. The traders belonging to these industries will plan their risk before they enter into a trade. Managing the lot size is always one of the top priorities of a Forex trader. It is a lesson certainly to be learned by binary options trader. A professional gambler will carefully choose the game to place his bet. The selection would be based on several factors such as experience, house edge, potential profit and success rate. Similarly, a binary options trader should select an asset after a lot of home work including back-testing and demo account trading. Only then binary options trading will result in profit. Random selection of assets for trading will not only result in losses but also demoralize the trader. Thus, asset selection process is an attribute to be learned from gamblers. Financial market (spot Forex, derivatives and equities) participants generally concentrate on a few assets but master their moves. Likewise, a binary options trader should give priority in selection of assets. Trading new assets on a real account may become suicidal. Invariably all successful gamblers exhibit exceptional ability in controlling emotions. A gambler knows that emotional control leads to better performance. It is a lesson, which a binary options trader should learn from gamblers. Occasionally, a binary options trader will face a series of losses. Only a trader who has control over his emotions will be able to overcome the temporary setback and continue with the business as usual. Those traders who get trapped by emotions will ultimately lose their entire capital. Most of the Forex, options and stock market traders face a series of losses occasionally. It is the emotional control which enables them to recoup their losses. As long as there is no error in the strategy a trader will continue to remain disciplined and unmoved by recent losses. It is must have virtue for a binary options trader. Forex and stock market brokers offer commissions when a client brings in a new member through his affiliate link. However, only few people succeed in raking up huge commissions. Social media networking and online marketing skills is a must to succeed in affiliate marketing. There are plenty of websites, which teach the basics about online marketing. A binary options trader who is looking to generate additional income through affiliate links should certainly learn promotion techniques from experienced online marketers. Merely being a good trader is not enough. A trader should have the expertise in withdrawing a portion of profits at regular intervals. Gamblers are known to possess great account management skills. They not only limit the risk but also enjoy their profits thereby keeping their morale high always. It is an ability which a binary options trader should certainly possess. Apart from gamblers, Forex, equity and derivative market traders continue to make regular withdrawals. Leaving too much money with a broker is never a good idea. The capital lying in a trading account will not yield any interest as well. A binary options trader should certainly look upon traders in other financial markets to learn systematic withdrawal process. As discussed earlier, success in binary options trading is very much dependent on technical skills. However, there are valuable lessons which can be gained from gambling, software, spot FX, equities and online marketing industry. A mature trader will have no qualms in giving importance to those lessons instead of discarding it because of its origin.